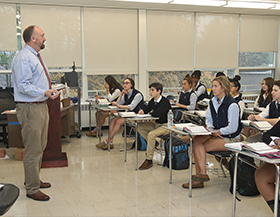 The faculty and staff of East Catholic High School is a group of devout individuals dedicated to the mission and vision of our school. Our mission to educate our students according to the Gospel and the life of Jesus Christ is the foundation of their everyday work. Each one demonstrates by example their love of learning and their strong moral foundation. To call staff or faculty members at our school, please dial (860) 649.5336 and the appropriate extension in the list below.